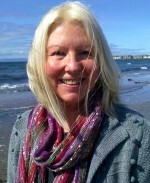 Maggie La Tourelle is a writer, holistic therapist and teacher, based in London, UK. The Gift of Alzheimer’s – New Insights into the Potential of Alzheimer’s and its Care, Watkins Publishing. This book gives an informative and moving account of a mother’s Alzheimer’s journey and a daughter’s perspective on it. It also offers a comprehensive guide for those involved in the care of people with Alzheimer’s. Principles of Kinesiology Jessica Kingsley Publishing. This book provides an introduction to kinesiology, a therapy that uses manual muscle testing to communicate directly with the person’s body / mind system and a range of powerful balancing treatments. In her therapy practice Maggie integrates counselling, psychotherapy, NLP coaching, kinesiology and energy work to bring about health and well-being in mind, body and spirit. Seminars and workshops on aspects of well-being and dementia care are offered to groups and individuals by special arrangement. For further information please see Contact.